Please select an option Heather gray Black Taupe Olive Burgundy Please select a color. Please select an option Small (2-4) Medium (6-8) Large (10-12) Xlarge (14) Please select a size. 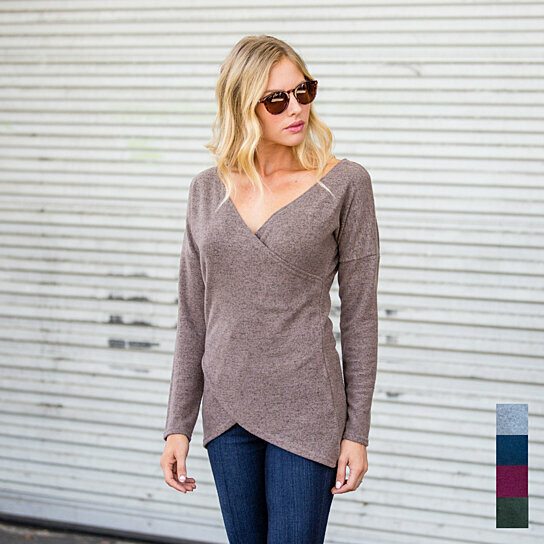 Modern and contemporary, this fashionable sweater features a unique cross-wrap design in a medium-weight plush fabric, ensuring easy transition from day into cool nights. Pair with a pencil skirt and heels for an on-trend office look, then swap for skinnies and boots for a night on the town.